Cambridge Vacuum Engineering has recently invested in a Baty R400 unit with FT2-E touch screen display, using the latest technology in measurement and inspection to ensure the highest levels of quality on behalf of their customers. Based in Cambridge, the company has over 50 years of experience in the design and build of process solutions, including the manufacture of Electron Beam (EB) systems and Vacuum Furnaces (VF). Cambridge Vacuum Engineering's range of equipment includes systems ranging from 50 to 200 kV with beam powers up to 100 kW, with applications in the aerospace, automotive and energy industries. The company prides itself on effectively applying professional engineering skills to customer requirements, resulting in innovative solutions to technical problems. The company's skilled workforce, experienced engineering department and extensive service team are backed up with a range of in-house test and diagnostic facilities. Offering global coverage, Cambridge Vacuum Engineering provides sales service centres in the UK and across the world. Although Cambridge Vacuum Engineering don’t have a dedicated inspection department, they do employ a team of extremely experienced and highly skilled engineers who have plenty of experience operating similar equipment. Staff from Cambridge Vacuum Engineering initially attended a demonstration at Bowers Group’s sales office and demonstration suite in Camberley, Surrey. They were impressed with the features and capabilities of the Baty R400, including its 400mm (16") screen with 90º crosslines and chart clips, profile illumination and wide choice of lens magnification choice. The FT2-E model chosen by Cambridge Vacuum Engineering boasts complete TOUCH SCREEN DRO with 2D Fusion Touch Software, and on-screen optical edge detection allows data points to be taken ‘on the fly’ as the projected image is passed under the screen mounted fibre optic sensor. The Fusion touch software enables full reporting capability including SPC, tabulated details with pass / fail analysis, saved in MS Excel compatible format and auto sequence programming feature. They were particular impressed with the quality of the image, which was a big improvement on the standard projector with standard display that they’d been using previously. 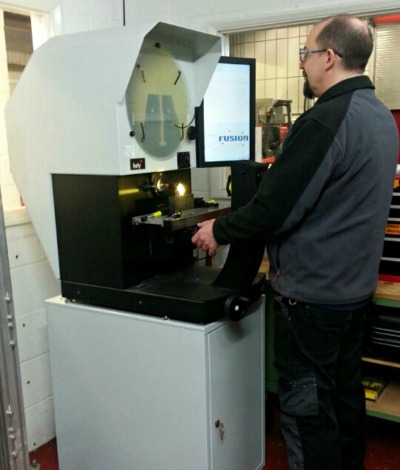 Cambridge Vacuum Engineering took delivery of the Baty R400 back in May 2015, and have since been using the unit to dimensionally check various sub-contract manufactured components and customer samples when required. The supporting image shows two components that the company regularly need to perform compliancy checks on. The component on the left is called a split collet and the one on the right is called a shaft adaptor, which are both used in one of their machine models. 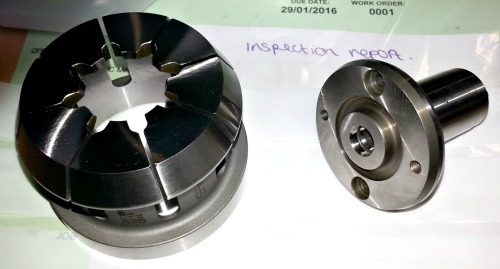 Both of these components are high precision, and although Cambridge Vacuum Engineering have them manufactured to a high standard both externally and internally to their own design and specification, they still require a further selection of tests in order to ensure that they are suitable for their needs. A variety of these checks, including measurements for angles, forms and radiuses, can now be carried out on the Baty R400 unit. The components in question are manufactured in many different sizes and configurations, and each one can now be checked in the same way. The customer part that is held between these two components can also be checked on the Baty unit, if an issue is to arise at the point of test and acceptance.